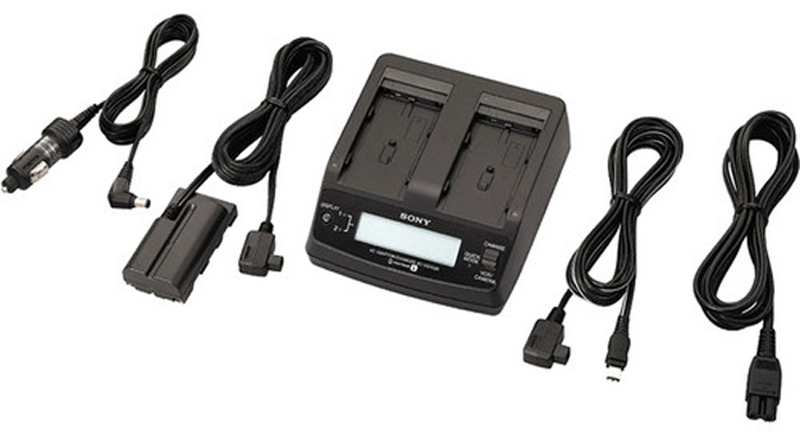 The Sony AC-VQ1051D AC/DC Adapter and Battery Charger charges two InfoLITHIUM L Series batteries back-to-back. Up to 70% faster than your camcorder's original battery charger, one battery will quickly power up, followed by the other. In addition, the LCD displays time remaining for a full charge as well as battery life remaining. The AC-VQ1051D can also be used to power your FX7, FX100, or other compatible camcorder as well as the Sony GVH-D700 HDV Portable Video Recorder. Connect the appropriate adapter to your car's DC cigarette lighter or your AC wall outlet for continuous recording. Dimensions 3-3/4 x 1-13/16 x 3-3/8"